More than half of the string figures described in this book open in the same way; to avoid constant repetition therefore, we may follow Drs. Rivers and Haddon (p. 148), and call this very general method of beginning Opening A. It should be learned now, because in the descriptions of the figures in which it occurs, the first movement will be simply noted as Opening A. It is formed by three movements. First: Put the loop on the hands in the First Position. 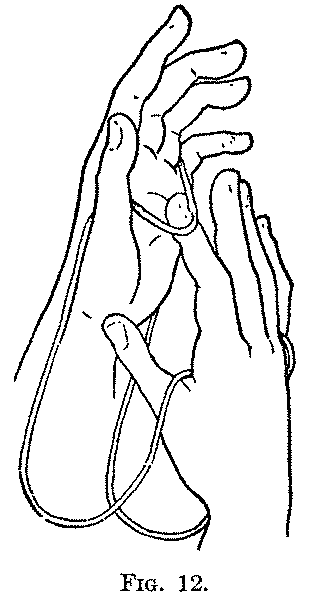 Second: Bring the hands together, and put the right index up under the string which crosses the left palm (Fig. 12), and draw the loop out on the back of the finger by separating the hands. 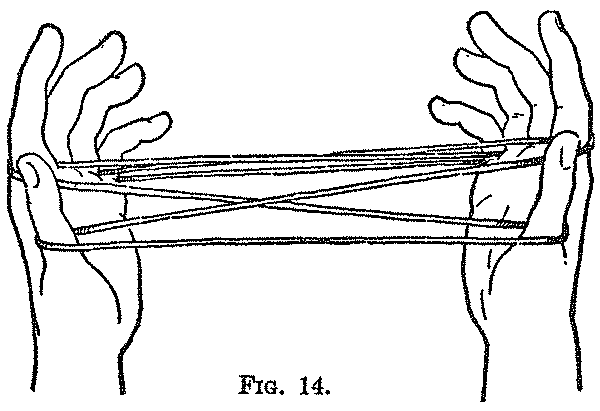 Third: Bring the hands together again, and put the left index up under that part of the string crossing the palm of the right hand which is between the strings on the right index (Fig. 13), and draw the loop out on the back of the left index by separating the hands. You now have a loop on each thumb, index, and little finger (Fig. 14). 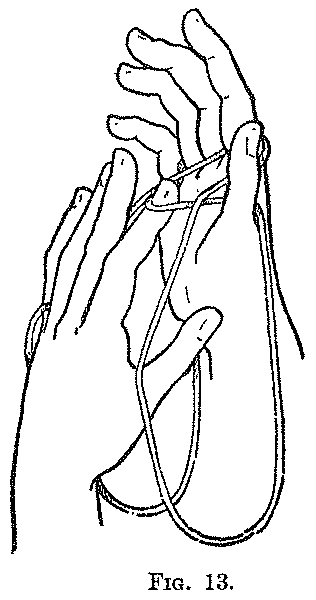 There is a near thumb string and a far little finger string passing directly from one hand to the other, and two crosses formed between them by the near little finger string of one hand becoming the far index string of the other hand, and the far thumb string of one hand becoming the near index string of the other hand. In forming many of the figures beginning with Opening A it is absolutely necessary to follow the order just given, and take up, first, the left palmar stringl with the right index, and then the right palmar string with the left index; it will save trouble, therefore, if this order be always followed, even if it make no difference in the result. If the reverse of this order is ever required, of course it will be noted in the description.